Community involvement in Orlando, Florida is important to us. We've been in the profession of helping people for 70 years, and it reaches past new Nissan cars for sale. Reed Nissan believes that everyone should bring value to their local communities, that's why we work with many different groups! We are happy to work with organizations like Community Based Care of Central Florida, a foundation committed to giving foster children the assistance they require. To us, you're more than a potential car shopper; you're a person with needs. If you have an action you want to set forth and think that our Orlando, FL dealership could help you execute it, let us know! You can contact us, and we'll have a specialist on it in no-time. Here at Reed Nissan in Orlando, if we can improve your initiative, we will. On August 3, 2017, Reed Nissan held our 1st Annual Reed Gives Back to Community Day. In partnership with Community Based Care of Central Florida, we celebrated our 3rd Annual Cars for Kids Giveaway as well, by surprising two deserving foster youth with brand new cars. At the same event, in partnership with Girl Scouts of Citrus, Reed Nissan recognized the success of dedicated and hard-working young salespeople by presenting the Top Cookie Award to the Central Florida region’s top three Girl Scout Cookies sellers for 2017. The event opened with a meaningful invocation from Dr. Joel Hunter, Senior Pastor of Northland Church. Maryann Barry, CEO of Girl Scouts of Citrus, provided more background on the Girl Scouts and their cookie program, as well as the hard work which goes into a successful cookie sales campaign. Gerry Glynn, Chief Legal Officer of Community Based Care of Central Florida, explained the work of CBC in our community – from their role as “surrogate parent” interested in supporting the well-being and success of all kids who come into their care, to providing further guidance and assistance as the same kids mature into adults. As “surrogate parents”, Glynn made clear how proud the CBC was of all of the young people nominated for the chance to win a car in 2017. They qualified based on the commitment each has shown to ensuring their own success, despite odds stacked against them. Also in attendance were Amelia and Melissa, the 2016 Cars for Kids Giveaway recipients who each shared their personal story of how winning the car has allowed them to thrive and make progress towards their goals. Finally, our 2017 winners were announced: Congratulations to Anthony and Nicole! You can learn more about the winners, both past and present, on the Cars for Kids Giveaway page. Thank you to everyone who came out to support the 1st Annual Reed Gives Back to Community Day! None of this would be possible without the ongoing support of our customers and our community partners. A special thank you to our prize sponsors: Shawn Turner with Spectrum, Austin Faber with Fox Sports, Susan Shepard with the Orlando Sentinel, Julie Drahos with WESH, Think Minion, Apple Air Conditioning, and Quick Snacks Vending, Inc. We look forward to another successful event in 2018! Reed Nissan works closely on a number of projects with Community Based Care of Central Florida, which oversees the region’s foster care system. The Reed family in Orlando and general manager Aaron Hill have personal connections to adoption, foster care and mentoring. 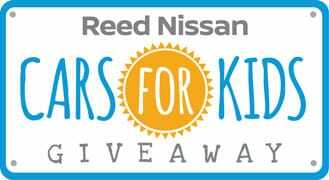 Reed Nissan’s Cars for Kids Giveaway, in partnership with CBCCFL, is committed to giving local foster youth the hand up they need to succeed. We are proud to support CBCCFL’s Youth Transitional Services program, which is designed to fill the gaps for those who do not have forever families to support and guide them. Last year Reed Nissan surprised two deserving young people with something they never dreamed they’d have, a car of their own. Talk about making a difference! Dependable transportation has allowed Jasmine to continue to pursue her dream of a college degree (she also serves as a mentor to current foster kids); and has been a life-changer for busy Bernard, a single father working two jobs while also taking college courses. This year, with your help, we’ve done it again! On August 23, 2016, two new deserving individuals who have come through the foster system received cars from Reed Nissan. The dealership once again donated two new Nissan vehicles to a pair of deserving students through their 2nd annual “Cars for Kids Giveaway.” The brand-new 2016 Nissan Sentras were given away to two students who are part of the foster care system in Central Florida. Amelia, 21, is a single mother of two. In addition to being a part-time student, she also works as a preschool teacher. This new car will help keep her family safe, while allowing Amelia to continue to make a better life for herself and her two sons. Melissa, 21, is currently a student at Palm Beach State College studying early childhood education. After her education and employment were put in jeopardy, she was pressured into purchasing a car with a predatory loan rate of 24%. Having a new car will free Melissa from crushing debt and stress and allow her to focus on completing her education while affording her basic needs. Would you believe that one in 50 families, right here in Central Florida will experience homelessness during the course of the year, or that one in six Central Floridians struggle with hunger? The statistics can be staggering and that is why it is so important to reach out and help in any way you can. Your generosity can give these families hope for a brighter tomorrow. No amount is too small. 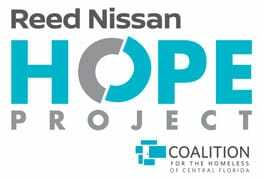 The Hope Project was started by Reed Nissan in 2015 to encourage Central Floridians to join the dealership in raising funds to benefit the Coalition for the Homeless of Central Florida (CHCF). “CHFC has a positive difference for the homeless community of Central Florida. We’re eager to support the Coalition’s mission, which is to not only provide the essential means of living, but also offer education, counseling and character development programs to help families and children leave homelessness behind.” said Aaron Hill, General Manager of Reed Nissan and Reed Nissan Clermont. Last year, Reed Nissan returned as the presenting sponsor of the Hearts of Gold Concert at the Hard Rock Live at Universal Orlando. On May 20, 2016, hundreds of Central Florida’s elite business and philanthropic leaders gathered at Hard Rock Live to eat, drink, and celebrate the transformative power of music in support of the homeless men, women, and children in our community. Over the past 23 years, Hearts of Gold has earned a reputation for fantastic live entertainment and a fun, casual atmosphere – all for a great cause. Last year’s event set a new fundraising record: $303,685! Reed Nissan will also be the presenting sponsor of the 2017 Hearts of Gold Concert on Friday, May 12th at Hard Rock Live at Universal Orlando. There will be wonderful food and drinks, as well as a phenomenal concert featuring special guests. All proceeds from the event will help local homeless families get back on their feet. To learn more about the Hearts of Gold Concert and how to get tickets, you can visit the Coalition website by clicking here. Coalition for the Homeless has a 29-year history of serving our community and has received a 4-Star Charity Navigator rating, the highest rating bestowed on a charity. Your tax deductible donation will make a direct impact on the lives of Central Florida’s homeless men, women and children. Click here to make your donation today! The 3rd Annual Reed Nissan Pet Rescue Project 90 Day Adopt-A-Thon resulted in an amazing 2,064 dogs and cats finding their FURever homes. Reed Nissan and the Pet Alliance of Greater Orlando could not be more thrilled at this achievement. We sincerely want to thank everyone involved with the Adopt-A-Thon, those who help behinds the scenes to the wonderful families that opened their hearts and homes to an animal in need. We thank you, the Pet Alliance thanks you and so do each and every dog and cat who now has a home and loving family to call their own. The 2017 Paws in the Park event, held on February 11, helped raise more than $104,000 as well as awareness to drive support for more than 8,000 homeless pets in the Orlando area. Reed Nissan once again joined the Pet Alliance of Greater Orlando to produce the event held at Lake Eola Park in downtown Orlando. Thousands of people attended and learned about the Pet Alliance, 16 dogs found their forever homes, hundreds of dogs got their “game on” at Lucky Dogs Lure Course, Splash Dogs and Canine Agility, and over $104,000 was raised to support the Pet Alliance of Greater Orlando. Reed Nissan is a longtime supporter of the Pet Alliance and the organization’s two shelters. Currently, the dealership donates a portion of sales from each car sold to the Pet Alliance of Greater Orlando, a pledge which raised over $47,000 in 2015. Reed Nissan’s donations go towards specific projects dedicated to the overall wellbeing of the animals at both adoption locations. To learn more about what can be done to help animals in need, and see pets that are currently available for adoption through the Pet Alliance of Greater Orlando, please visit the Friend In Reed website today! Attentive commuters may have noticed the Reed Nissan “Cookie Express,” which has been on the road since February 5, 2016. Thanks to the Reed Nissan, the Girl Scouts of Citrus Council are now able to transport cases of cookie inventory and other supporting materials to cookie sellers near and far. The colorful van is turning heads and drawing attention to the world’s largest girl-led business. One hundred percent of the net revenue raised through Girl Scout Cookie sales in the Central Florida area stays with Citrus Council and its troops, so customers who purchase Girl Scout Cookies are not only getting a delicious treat, but they are also making an important investment in their communities. During Girl Scout Cookie season, each young #cookieboss is not only selling delicious cookies, but she is also building essential life skills: goal setting, decision making, money management, people skills and business ethics—the “Five Skills” of the cookie program. The more cookies girls sell, the more money they have to invest in community service projects and learning experiences such as travel opportunities. Reed Nissan: Driven To Help Save Lives! Did you know that for every 2 seconds that pass, someone in the U.S. needs blood? Since its beginning in 1942, Florida's Blood Centers operated on the philosophy of people helping others. Since then, Florida's Blood Centers have consistently provided communities with a safe and adequate supply of blood, thanks to the generosity of volunteers and donors. There is always a need for all blood types. Schedule an appointment with Florida's Blood Centers by calling 1.888.9.DONATE or by visiting their website. Be a local hero, and save lives. In April 2009, Merideth McDonald, founder and director of BIG Life , had her world turned upside when her life was forever changed by a Traumatic Brain Injury (TBI). Nate, her husband, was in what was thought to be a fatal motorcycle accident. Fortunately, he survived – and Merideth and Nate were inspired to turn their indescribable pain and trial into purpose! “BIG” representing Brain Injury Group, a 501(c)3 organization set out on a record-setting feat on September 10, 2016 by inline skating nearly 1,500 miles, through twelve states and Washington D.C., from New Smyrna Beach, Florida to Boston, Massachusetts! When we learned about their incredible dedication to this under-appreciated cause, we were inspired to create the Reed Nissan BIG Skate Nissan Altima for their heroic journey. A few spills resulting in scrapes and bruises, one traffic stop – for coming down a very steep bridge not necessarily appropriate for skating down (and even then, the police officer was friendly and just wanted to remind them to be safe), and many new friends and stories later, Merideth wrapped up her BIG Skate on October 14, 2016. The epic adventure Merideth and Nate embarked upon succeeding in raising awareness about brain injuries, encouraging survivors and caregivers, raising funds to develop the BIG Life campus and expanding the BIG Life mission throughout our community, state and beyond. The OPD Mounted Patrol is near and dear to our hearts at Reed! Since 2006, Reed Nissan has provided a Nissan Titan to the Orlando Police Department's Mounted Patrol. It has seen its fair share of use and is still looking great. Tasked with pulling the Mounted Patrol's horse trailer, the OPD Titan also made a trip to New Orleans to help with Hurricane Katrina relief efforts. That is just a small list of things this Nissan Titan has seen during its police career. Much appreciation and thanks goes out to the Orlando Police Department for protecting and serving our community and country! Reed Nissan is the presenting sponsor of the annual Always Wear Your Seatbelt (AWYS) 5K, benefitting the AWYS Foundation. The AWYS Foundation was founded on September 21, 2012, by their mothers in loving memory of Laura Grant and Eddie Culberhouse, who lost their lives in an automobile accident on February 6, 2011. Their mission is to save lives through raising awareness and educating teens to always wear your seatbelt, if not for yourself, for Laura and Eddie. our projects in the the news! With each passing year our commitment to the greater Orlando community grows stronger as do our partnerships with many wonderful organizations. Below are some of our community partners. Visit FriendInReed.com today to see how YOU can help out these wonderful causes that do so much for the greater Orlando area!